36-41 F, but storage is not recommended. From the Latin “niger” (black) referring to the color of the seeds. The seeds were used in breads and cakes in the Middle East. Egyptian women ate the seeds in an attempt to become plump which was a sign of beauty. The specific epithet name “damascena” means of Damascus. The inflated seed pods are a popular dried item. Our experience shows is has a high tendency for petal drop. We have been treating it with STS with good success. 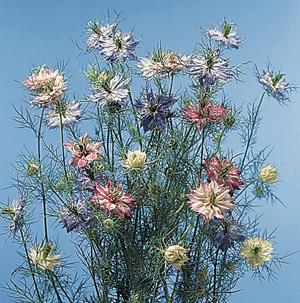 It is also a great seed pod item after blooming. Blue outsells the pink and white.